The decision by the European Union (EU) to boycott Jewish organisations and institutions based in the West Bank and East Jerusalem will bring much joy to the Arab world’s on-going vicious hate campaign of denigration and demonization of the Jewish State. The EU announcement heralds the end of any influence it has as a member of the Quartet - America, Russia, the United Nations and the EU - which itself can now no longer claim to act as an impartial negotiator seeking to bring about an end to the long running conflict between Jews and Arabs whilst the EU remains a member. 1. Forbidding the transfer of EU funds to non-government organisations in Israel engaged in activities designed to advance the interests of the Israeli Arab population to the detriment of the Jewish majority. 2. Ending all co-operation with the EU in Area C of the West Bank by terminating existing development and infrastructure programs for the benefit of the Arab population and forbidding any such activities in the future. 3. Ordering the closure of the office of the Delegation of the EU to Israel. The illegality of Israeli settlements has never been the subject of any binding authoritative legal decision to my knowledge by any court anywhere in the world. At best the EU longstanding position is an opinion - and nothing else. 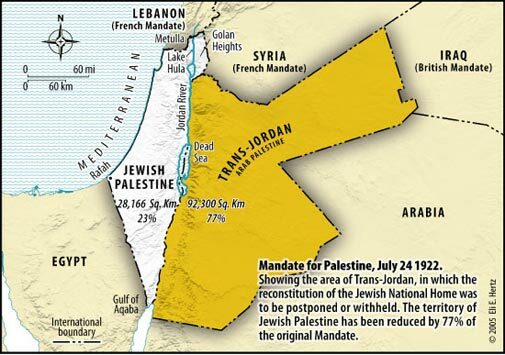 It is counterbalanced by other opinions that take the view that Jewish settlement in the West Bank and East Jerusalem is legal by virtue of the provisions of article 6 of the Mandate for Palestine and article 80 of the UN Charter. In fact the courts of one of the EU member states - France - ruled that Israel did not violate international law by building a light rail line in eastern Jerusalem. The ruling on March 22 by the Versailles Court of Appeals came in response to a lawsuit filed in 2007 by the Palestine Liberation Organization and the France-Palestine Solaridite association against three French firms that participated in the construction of the light rail network. The plaintiffs claimed that the firms were responsible for human rights and international law violations. The EU position is certainly on very shaky ground. The EU decision has acted to interfere in the determination of secure and recognized boundaries between Israel and Palestine by pre-empting that Israel has no claim to sovereignty in any part of the West Bank and East Jerusalem. The EU is free to pursue any policy it wants - but also must accept the responsibility for the fall - out and criticism that will inevitably follow. Does the EU now take the gracious step and bow out of the Quartet due to this conflict of interest - or does it have to be told to go packing by the other members of the Quartet? The EU clearly cannot be both judge and jury and the remaining three members of the Quartet must make that very clear immediately - if they themselves wish to retain any credibility and influence in resolving a satisfactory outcome to the Jewish- Arab conflict.